Practice Good Posture in 2018 – Which Posture Corrector is Right for You? Like many of us, you are probably still deciding on the perfect New Year’s Resolution. Instead of choosing the typical resolutions like dieting or exercise that will most likely get broken within the first 2 weeks, why not have a goal that provides instant results such as practicing good posture? If you have noticed that your posture has been suffering for months or even years, you may want to forego the standard new year’s resolution and straighten up your posture instead. Changing your posture habits isn’t as hard as you think, and you can actually start to see improvement in as little as a few hours. The first step to achieving good posture is to determine what part of the day your posture starts to slip so you can take action during that time. Whichever posture correcting device works for you, you can typically see results within the same day. When I say results, I don’t mean an instantly perfect and straight back, but more of a soreness like you just worked out for the first time in a while. Bad posture does not happen overnight and therefore good posture will not happen immediately either. When your posture starts to slip, your body adopts bad habits gradually and they become the new comfortable standard. For example if you stand at a high-top workbench for most of the day and you start to place your foot on the bottom shelf as a crutch to give your back a break, you will soon find that this foot placement will be practiced more and more because you feel like you are giving your back a break. What is actually happening without you even realizing it, is that your upper back gradually loses muscle mass because your back muscles do not need to support your spine as it once did, because your foot and leg is now taking on the pressure of supporting your spine. You start to feel pain in your upper or lower back because you have shifted your body weight into an unnatural position, impacting other infrequently used postural muscles. Your body naturally defaults to this elevated foot position several times a day and you find that your leg or foot starts to fall asleep now, and you have this back pain that you never felt before. All of these symptoms are caused by the simple fact that you are not practicing good posture by placing your foot up on the bottom shelf of your workbench. So how does this relate to feeling instant results? When you read about the posture correcting devices below and make a decision as to which one fits your lifestyle, you will notice that you will feel soreness after the first wear, or the first exercise. This occurs because the devices or yoga poses will activate your core postural muscles when you practice good posture during your wear time. These muscles may have become inactive or seldomly used because you transfered your weight to other muscles or body parts. However, once these core muscles are activated, you may feel a gentle soreness – this is the instant results that I was referring to. The soreness means that your posture corrector or exercise is indeed working and will continue to strengthen your postural muscles gradually over time with repeated use. We all have completely different working environments and routines throughout our day, so in order to choose the perfect posture corrector for you specifically, think about how much time you spend on your feet, sitting down, and doing physical activity. There are multiple posture corrector options out there and some of them work better with certain environments. What does your daily routine consist of? If your job or lifestyle requires you to sit at a desk for most of the day, you may want to consider a clavicle brace or electronic posture corrector. The clavicle brace will conceal underneath your clothing so noone sees it, and the gentle pull of the brace will remind you to pull your shoulders back throughout the day resulting in an upright posture at your desk. Another great option if you have a desk job is an electronic posture corrector like the Upright. This type of posture corrector connects to an app or desktop icon where you can monitor your good posture throughout the day and recieve realtime alerts and reports. Since you will be at a desk and most likely have a computer at your fingertips, this option may be right for you, especially if you have a few spare minutes here and there to check the status. The electronic posture corrector consists of a small device with sensors that adhere directly to the skin on your back. You calibrate the device each day so it knows what position good posture is, and then as you slip out of that good posture stance, the device alerts you of your bad posture and you can correct it in real time, or see a report of the times of day that you did not have good posture. If your daily work environment places you in one spot on your feet for hours at a time, you may want to consider wearing a posture shirt or performing yoga exercises. Posture shirts can be worn underneath clothing or a uniform and conceal quite nicely. They typically feel like a tight fitting undershirt and have built in fabric sensors that activate your posture muscles throughout the day. The design of the posture shirt gently tugs your shoulders back which aligns the spine and also supports your lower back. If wearing an additional layer or undershirt is not for you, you can always practice certain yoga poses and stances before, during, or after work. Stretching your spine and back is always a good idea, especially when you are poised in one standing position for your entire workday. Simple yoga stretches like mountain pose, warrior pose, or tree pose are all standing poses that you may even be able to sneak in when customers or colleagues are not working. These poses help to stretch the spine and promote circulation and air flow through the body. They are also quick and easy to do and can make a big difference in your work day if you can spare a minute throughout the day for each pose. Other poses that require more full body stretches and more floor space include downward facing dog pose and cobra pose. Where is your posture slipping? Another important factor you should consider when deciding on how exactly to go about correcting your posture, is to determine what point of your day do you noticeably see your posture go south? For example, do you catch yourself slouching at your desk around 3 or 4 in the afternoon? Do you immediately start to reposition your body weight to one leg at your standing counter first thing in the morning? The reason I ask, is because if you decide to choose a wearable product like the clavicle brace or electronic posture corrector, you may want to start wearing the device around the normal time your posture starts to slip. 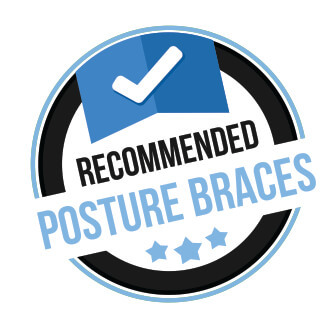 With most posture braces, you typically start wearing them for an hour or so at first and then gradually increase the wear time up to several hours over the course of a few weeks. This gradually introduces good posture to your mucscles instead of all at once. Like I said before, you may feel stiffness or soreness, which is normal, especially if you have very poor posture. It’s just like working out muscles you havent used in a while and you need to strengthen them again. So what kind of posture correcting options are out there? Here is a breakdown for you. Clavicle braces are not only for healing a broken collarbone or supporting your upper back; they also promote good posture by gently pulling the shoulders back. This gentle tug serves as a constant reminder to straighten your back which enhances your posture. Clavicle braces serve as a great posture corrector option because they are light weight, affordable, and effective. Electronic posture correctors like the Upright are the posture braces of the future. If you’re a techy and like to incorporate electronics and data into your posture correcting experience, this is the way to go. These products are perfect for people who sit at a desk most of the day and have easy access to their smart phone or a computer screen. The electronic posture correctors do need to be calibrated before each use, so you need to have a few extra minutes before getting started to adhere the device to your lower back and calibrate and sync it to your smart phone app or desktop app. What’s interesting about these correctors is that you can download daily reports to see where your posture was good or bad. You will also be reminded in real time when your posture is slipping so that you can sit up and fix it. If you think you would like this type of structure and constant reminding, you can read more on my review of the Upright here. Yoga exercises and stretches are extremely good for your posture and help to boost other body systems like the circulatory system and respiratory system. This is more of a holistic and all natural approach to practicing good posture. If you are flexible and able to perform certain poses and stretches, or find that you lack the flexibility and want to add stretching and poses into your daily routine, this may be a good alternative for you. Some posture benefiting poses are listed below and if you can fit any of them into your day, you should feel and see results instantly. Your body may feel a bit sore from not practicing these stretches regularly, but that’s ok. This is just an indicator that your postural muscles are weak and they are activating now, resulting in strengthening the muscles that are crucial to having good posture. Yoga poses are not only physical stretches and movements but they also enhance your airflow throughout the body by focusing on your breathing and mentally thinking about your body weight and energy moving throughout your body. Your movements should be slow, controlled, and defined. This activates your core muscles as well as postural muscles that promote good posture. Many people perform yoga poses and stretches first thing in the morning to wake the body up and have a refreshing start to their day. If you can’t accommodate this, but have time throughout your day, that is good too. Poses do not require a ton of time to perform, so you can squeeze the standing poses in at your convenience. Just remember to do them in a quiet and stress free environment in order to gain all the mental benefits from yoga. Mountain pose may look like you are just standing straight to many people, but it’s much more than that. Mountain pose is performed by standing with your legs together and big toes touching. Transfer all of your weight to the balls of your feet and lift your toes off the ground, then slowly bring them back to the ground. Transfer your energy and body weight down through your ankles and into your heels. Bring your shoulders back and open your chest while continuing to breathe in and out normally. Warrior Pose is a forward lunge where your back foot is placed outwards 90 degrees, your front knee is bent 90 degrees, and both hands are together reaching upwards over the head towards the sky. Warrior Pose is great for aligning the spine and stretching the back. making an upside down V shape. This pose stretches out the spine as your body weight is transferred to your hands and feet. Cobra pose is also done on the floor. Start by laying flat on your belly and stretch your feet out so that the tops of your feet on touching the floor with your toes pointed out. Gently place your hands flat on the floor and raise your upper body up towards the ceiling and keep your hands in line with your chin underneath you. This makes your spine concave and is a great stretch particularly for people who are on their feet all day. Posture shirts and undershirts like AlignMed are great for people who are active throughout their day. Even people sitting down for most of their day like them. 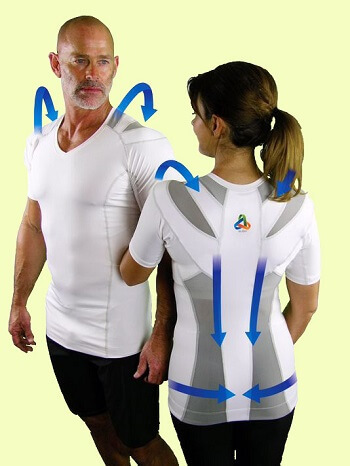 Like the clavicle brace, posture shirts have built in sensors in the material that activate postural muscles in the shoulders, down the back, and also in the lower back. The tight fitting material activates these muscles throughout the day, serving as a reminder to sit or stand up straight with good posture. The shirts do not limit your ability to move, lift, or bend like the clavicle braces may do. They can be concealed underneath your clothes or worn like a regular everyday tshirt – your p reference. Some brands do tend to be on the higher end in this category, but many people swear by them and end up ordering multiple colors and styles. To learn more on posture shirts, read my recommended brand which I have personally worn and reviewed here. No matter which device or exercise you choose to start with in order to keep good posture, you can typically feel actual results your first day – a gentle soreness like you worked out your back muscles. This instant gratification will most likely give you the motivation to keep up with practicing good posture. Permanent results may take several months, depending on how bad your posture is. Remember that good posture is something that must always be practiced on a regular basis, otherwise you can gradually slip back into poor posture habits. The Alignmed Posture Shirt is a unique posture correcting t-shirt that I’ve been wearing for over four years now and recommend as my Best Choice Overall for improving posture. 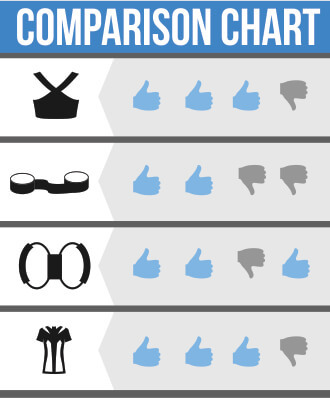 I’ve found that most traditional posture braces are too rigid and uncomfortable, restricting my range of motion and causing discomfort after wearing for only a short period of time. The Alignmed shirt has built-in tension panel Neurobands which have been scientifically proven to increase scapular stability and retrain muscles to improve posture. It’s comfortable enough to wear throughout the entire day. I have noticed a huge difference in my posture since I started using this shirt. You can read my review on the Alignmed Posture Shirt here.